So Bryonman, how's the training going? Oh yeah. I forgot this was initally a training blog. Recently it has become a life blog. As I deal with random and senseless B.S. at work I use this as an outlet for my frustration. Believe me, I have spared my good audience with a ton of baggage on the work front in 2013. I know that everyone has the same issues or similar ones ... so why air redundant grievances? Training is going quite well. I am still improving on all three disciplines. I've made MARKED improvement in my running and cycling in 2013. The time away from racing has allowed me to get smarter about getting stronger and faster. I have a marginally busy fall with a few big races. Granted, I purposely do not have a schedule anything like 2011 or 2012. In 2012 I ran about 800 miles - total. In 6 months of 2013 I ran 800 miles. I am already over 900 miles for the year. What I love the most is that the same run paths that worked me over last fall are not nearly as tough this year. I owe so much to my durability. I just keep on going. I suppose I am being smart about recovery ... but I know a ton of smart runners that have injuries stacked against them. I do not take this for granted. Running is my favorite and I suppose it always was ... but I am still at my best on the bike. Riding on the streets has not been my theme this year. There's just too much risk involved with not riding on a closed and controlled course. Plus, it is a mental victory to sit on that spin bike for hours and keep the RPMs above 90 and the wattage over 200. Endurance is 90% mental and 90% fuel. I typed what I wanted there. I swam last night and swam well. I felt like I had speed and power - which is rare for me. I am still a turtle compared to the speed demons but if I needed to swim for my life I have that capability now. The Pikes Peak Ascent 2013 is August 17th. Only 20,000 or so people have ever finished that course. It could be that this winds up as my crowning event in endurance related activities. It is 8000 feet of elevation gain in 13.5 miles. It starts at 6000 feet of altitude and goes to 14,200 feet. I've trained all year for it. I have about 10 more training days to prepare before I back off and rest up. Greetings and salutations ... the three of you reading this blog might have forgotten about it. From the 5th until the 14th we were on the road. Seeing the sights and hiking some trails. Baron the dog went for his first road trip. He traveled very well and hiked all 60 miles or so that we hiked. He was tired when we got back to Phoenix. So were we. We basically spent a week or so driving around the perimeter of Nevada (HA HA). Day #1 - Phoenix to Fresno, CA. Mostly driving that day. Someone tell LA that their city is the definition of urban sprawl. They may know that already, but please feel free to tell them again. Day #2 - Redding, Weed and Mt. Shasta! Redding seems like a very nice town and a very manageable population. Shasta! That is a fantastic mountain. We hiked and explored many areas. There is a nice little community college in Weed that has a degree in snow sports. That's awesome. 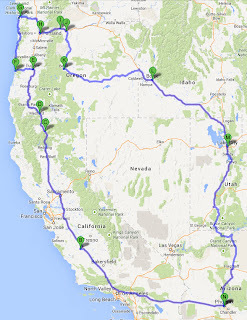 Day #3 - Ashland, Medford and Eugene, Oregon. Ashland has a nice downtown area and we explored the Shakespeare Festival setting. It is impressive. Medford has some cool hiking in and around the town. Eugene was the highlight city of the trip. We saw the track where history often happens. OU is an impressive campus. We found a covered bridge across Wildcat Creek on our way to Mapleton, OR. We hiked around there quite a bit. We were all alone. In Florence, we found some tourist pamphlets. Florence seemed nice and that's where we saw the Pacific Ocean for the first time on this trip. Cool and windy! We toured the Tillamook Cheese factory. I sometimes miss factory/assembly line work. We saw some Sea Lions, some Light Houses, hiked amongst the old-growth forests and hiked all alone on a trail up to Bloom Lake. The lake was not the highlight of the trail -- the trail was the highlight. Portland has always been interesting to us. I think I hyped it up too much in my head. It is scenic BUT it is still a giant city with traffic snarls. We visited Sauive Island, the Arboretum (we saw Ranier from there) We then crossed over into Washington and hiked all over the Fort Vancouver National Site. Portland to The Dalles was super scenic. We stopped off in Hood River to watch the kite boarders. I now want to try kite boarding. We saw quite a bit of The Dalles. That is a nice city. The Columbia River provides great scenery. The Tamanawas Falls hike in Mt Hood is a busy trail, but for good reason. That is what I would draw if someone asked me to draw a picture of a waterfall. Amazing. What a great hike to have on the anniversary! We saw Bend. Bend is also a nice city. It is also fairly isolated if you are trying to go to the east. It's a little less scenic and a lot more dangerous driving from Bend to Boise, ID. Twisting, hilly, two lane roads with very few passing lanes were the flavor of the day. At one point we were behind a motorcycle with two people pulling their little trailer and the semi in front of them blew out a tire and nearly knocked them off the bike. They went into a skid and I slowed way down trying to figure out which ditch to take if it dumped them. They recovered before the bike threw them. Spooky. We were happy to be off that road and back to the freeway. Boise is a larger city - but it has appeal. It lacks trees for the most part. After an oil change in Boise we blasted down the freeway to Salt Lake City. By this day we were all SPENT! When we arrived in SLC, we took a nap. After the nap we found some parks and hiked around the city quite a bit. Again, the city is too big for our liking but the mountains are scenic. Driving. Then we got to within an hour of the house on the I-17 and there was an RV rollover that blocked both southbound lanes. Traffic backed up for over 30 miles. We U-turned and went up through Payson and down to Phoenix on 87. We arrived home safely - just 3 hours after we could have ... oh well. 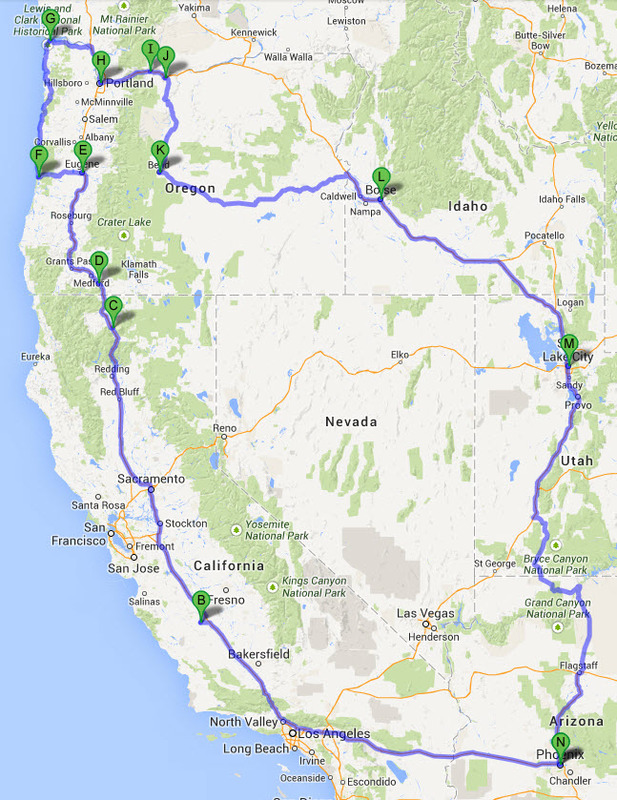 3600 miles of driving. 60 miles of hiking. Fun times! I've done a decent job of balancing my endurance life with the remainder of life throughout 2013. I have still managed to keep my fitness levels where they were and even get a bit better in most cases. Now it is time for some new goals as I head into the rest of 2013. 1) Eat more "whole" foods. The nutrient difference is obvious when I eat like humans are supposed to eat. 2) Get more swimming in. I have been swimming, but there needs to be more. Those swim sessions need to be drill oriented rather than straight swims. 3) Hydrate smarter. Timing is everthing. 4) Take the run to the next next level. I said next twice. I have already achieved a new level this year. There's more to be achieved. With coffee gone from my diet I should start seeing things level out as far as acidity. I will probably start supplementing some B-12 tablets to keep the energy levels higher.